We manufacture our range of Cryogenic Liquid Chillers in the state of art facility as per industrial standards. 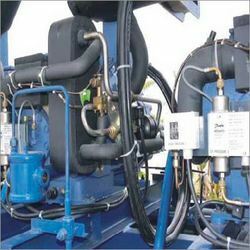 We offer our liquid chillers in a wide range to cater to the rigorous demands of chilling units in various industries. Our wide range is highly appreciated for their longer service life & corrosion resistance nature. All these attributes along with their cost effective rates have made the first preference of the clients world wide. The Cryogenic Liquid Chillers offered by us are in compliance with prevailing international and national market standards. Availability of our range in varied specifications have enabled us to cater to the requirements of the clients from various industries. Longer service life and corrosion resistant are some of the characteristics of our products, which enables us to maintain the high demand. Looking for Cryogenic Liquid Chillers ?